One does not have to give up flavor when adapting family favorite recipes to make them healthier. These meatballs are tender, moist and full of flavor but are made with low fat chicken breast meat instead of the usual beef or pork combination. The trick to making these meatballs tender is to actually use chicken breasts finely chopped rather than using ground chicken or turkey which makes them too dense. We like to serve these meatballs separately from the pasta as a second course, and prefer some type of short pasta such as penne or rigatoni to use the sauce on. The sauce is much healthier flavored with chicken rather than the traditional beef and pork, and can also be used to top any pasta, gnocchi, polenta, or used in lasagna. Poultry, particularly the white meat, is a great source of low fat protein. Using white meat chicken to flavor the tomato sauce instead of beef or pork makes a lighter tasting sauce with less fat. These tender chicken meatballs are tender, delicious, and much healthier than the traditional ones made with beef or pork. Serve the sauce over pasta to start the meal, and offer the meatballs on the side as the main course. To make the sauce, heat the oil in a large saucepan and cook the onions until soft. Add the garlic, and cook until it is fragrant. Add the wine and cook until it has almost evaporated and then add the tomatoes, tomato paste, 2 cups of water, wine (if using) and seasonings. Wrap the chicken breasts in plastic wrap to protect them, and place them in the freezer until they are slightly firm to the touch, but not frozen. Remove from the freezer, and using a sharp knife, cut the chicken into tiny pieces, smaller than little peas. In a bowl, place the chicken, egg, cheese, and seasonings. Squeeze some of the excess milk from the bread slices, and crumble this into the chicken mixture. Mix well with your hands until the bread is blended into the chicken well. The mixture will be quite moist at this time. 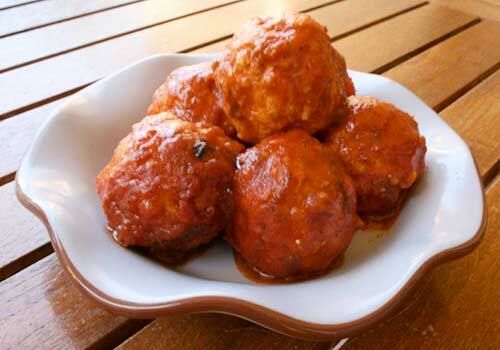 Using wet hands, form the chicken into golf ball sized meatballs, and carefully drop them into the simmering sauce. Use up all of the chicken mixture in this fashion and then leave the pot partially covered, and simmer for 20 minutes. Carefully stir the mixture, and then cook another 40 minutes. Serve the sauce over your pasta of choice cooked al dente with the meatballs served on the side. Sprinkle some grated cheese on the pasta if desired.